Documentation is always a work in progress as it is only useful when users are actually able to benefit from it. We have compiled here the information that we believe will be of practical use. If you find that something merits being included or discussed in more detail, please use the contact form and we will adjust this document as appropriate. 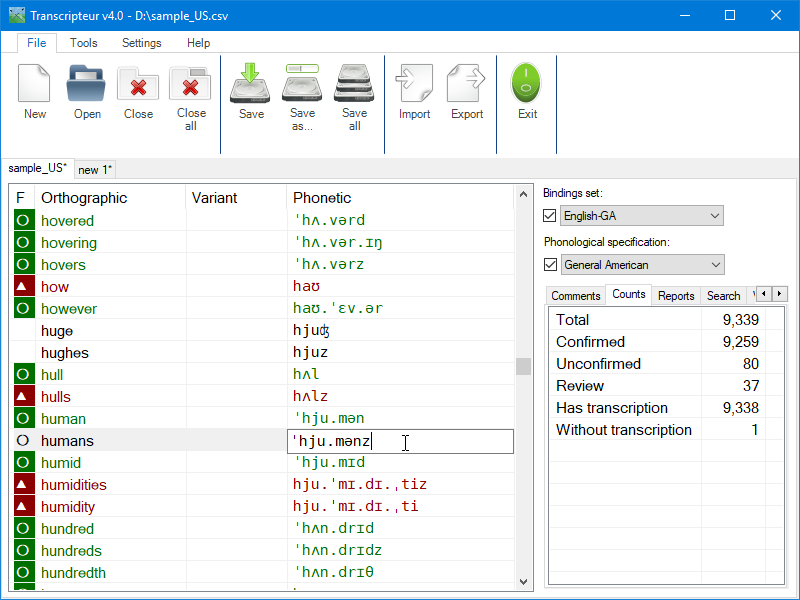 Transcripteur has been designed to simplify the task of creating, maintaining, and managing large collections of phonetic transcriptions. 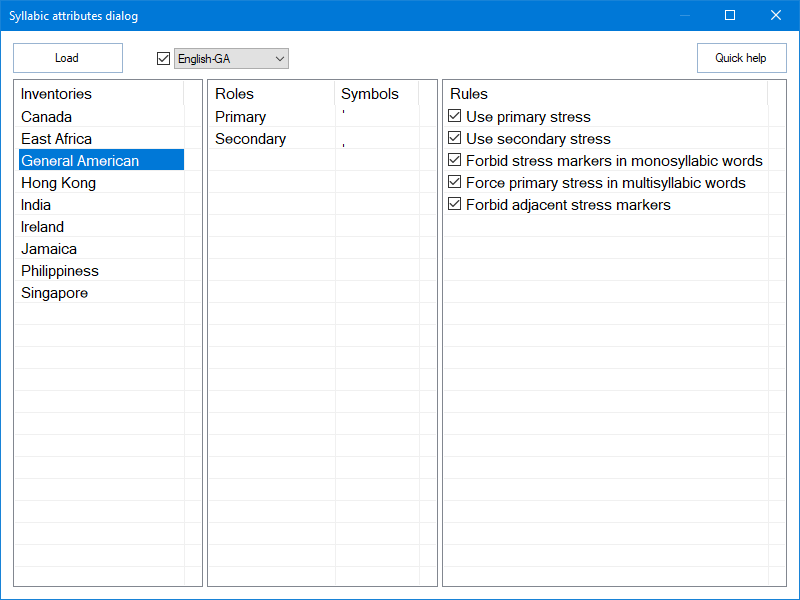 Transcripteur has been designed to be used by language researchers and pedagogues seeking to carry out certain kinds of linguistic analyses. Please read this documentation carefully and contact us if you have any problems. Press INS to insert a new set. Press Alt + INS to duplicate a set. Press DEL to delete the selected set. Right-click to rename a set. Click on the header to sort sets. Press Ctrl + Up/Down to rearrange the selected set. Tooltips show the full paths of sets. Ctrl + left click to copy a set's full path to the clipboard. Set files can be dragged and dropped directly from Explorer. 'Add inventories' adds one or several inventories to the key-symbols list. Left-click to edit a keyboard shortcut. Press INS to insert a new symbol. Press DEL to delete an inventory or items in the miscellaneous group. Associations can be dragged and dropped on another bindings set. 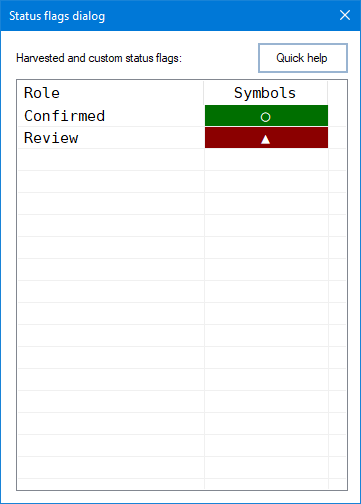 Type a pattern and press enter to isolate the entries whose orthographic content match the pattern. Type a pattern and press enter to isolate the entries whose phonetic content match the pattern. 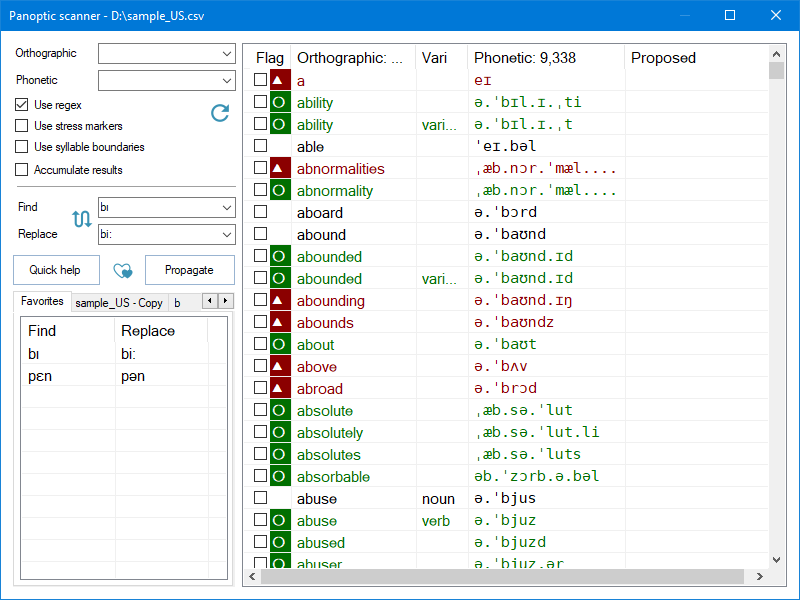 Checked to use the orthographic/phonetic pattern as a regex expression. Unchecked to use the orthographic/phonetic pattern as a wildcard expression. Press the ⟳ button to reload the entire list. Check some entries then type a substring to find, a substring to replace it with, and press enter to show the results in the 'Proposed' column. Press the 'hearts' button to add the find/replace pair in the list of favorites. 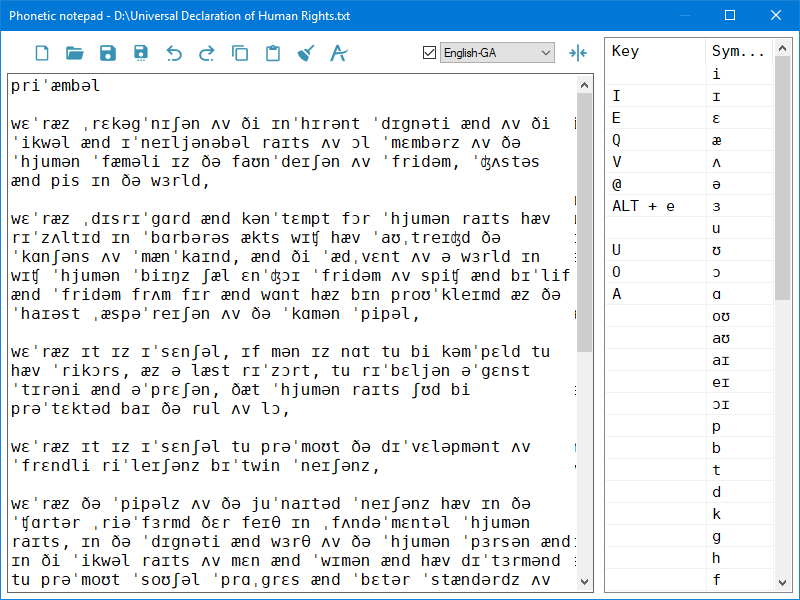 Press the 'Propagate' button to replace the phonetic transcriptions of the checked entries with their corresponding 'proposed' transcriptions. Load a file or type one phonetic transcription per line. Lines that start with a * will not be tested. Double-click on a line to go to its report analysis (if applicable). Show/hide the bindings cheat sheet with the →|⟵ button. Press the ⟳ button to run a test on the transcriptions' list. Right-click on a report tab to close it. Drag and drop report tabs to rearrange them. Click on a line in a report to bookmark it. Show/hide the document map via the configuration. Press INS to insert a new entry. Press Alt + INS to duplicate a entry. Press DEL to delete selected entries. Right-click to rename an entry. Click on the header to sort entries. Press Ctrl + Up/Down to rearrange selected entries. 'Integrity checks' carries out a number of agreement analyses on the pool and loaded inventories. 'Align pools' sorts the attributes of vowel and consonant pools according to order of each attribute pool. Press INS to insert a new vowel. Press Alt + INS to duplicate a vowel. Press DEL to delete selected vowels. Right-click to rename a vowel, its attributes, or sonority. Click on a header to sort its column. Press Ctrl + Up/Down to rearrange the selected vowels. 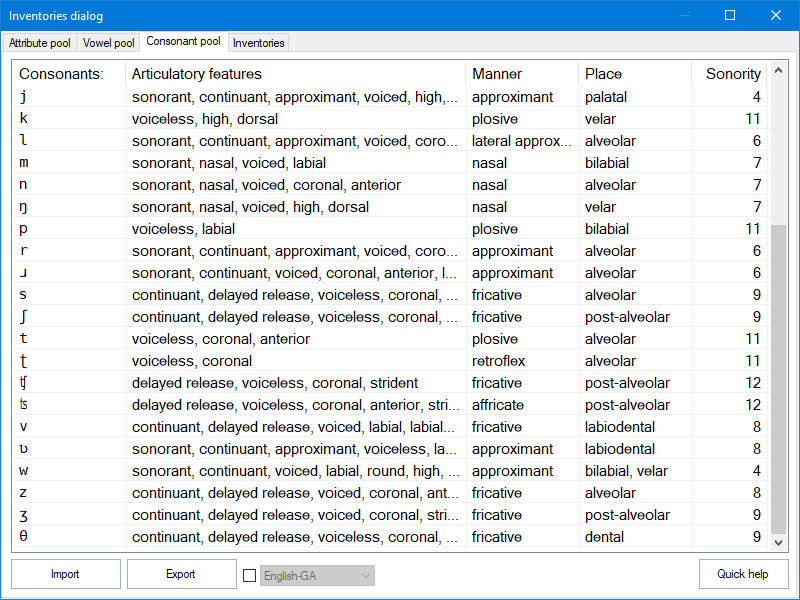 'Import' vowels from phonological specification files. 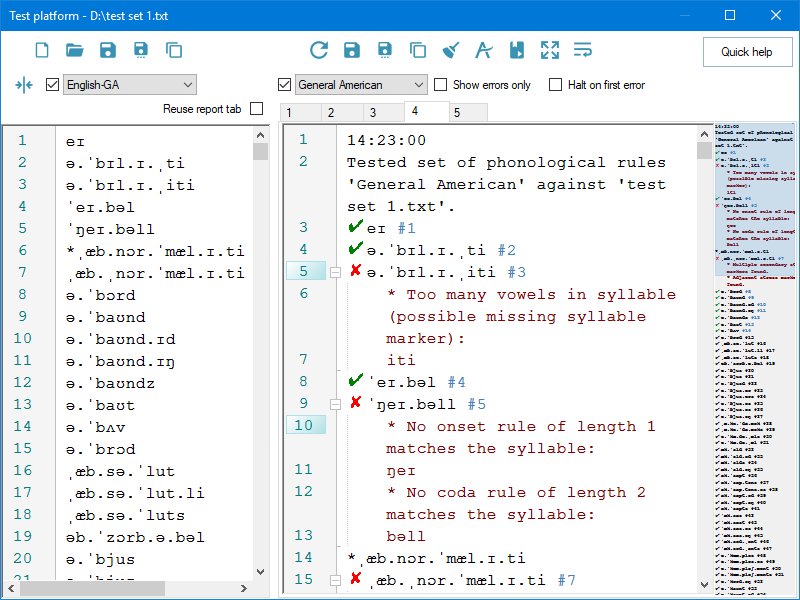 'Export' all/selected vowels to a phonological specification file. Press INS to insert a new consonant. 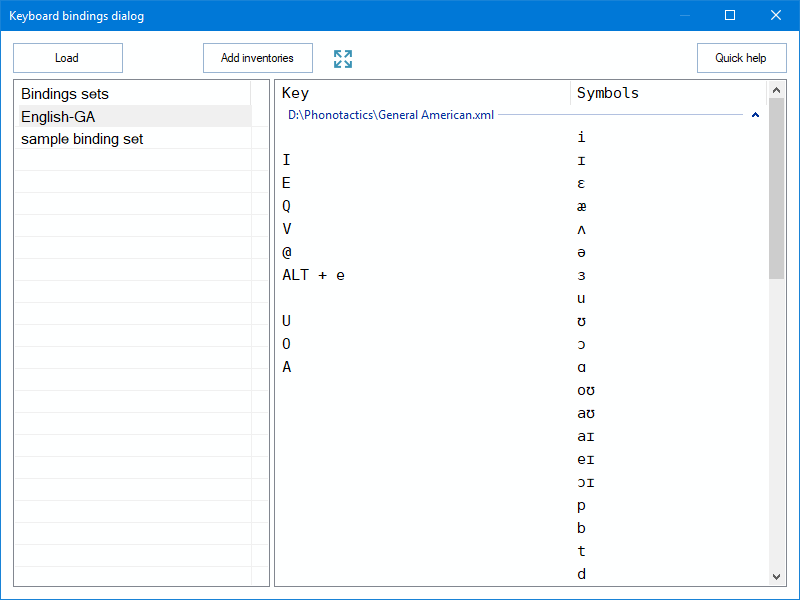 Press Alt + INS to duplicate a consonant. Press DEL to delete selected consonants. Right-click to rename a consonant, its attributes, or sonority. Press Ctrl + Up/Down to rearrange the selected consonants. 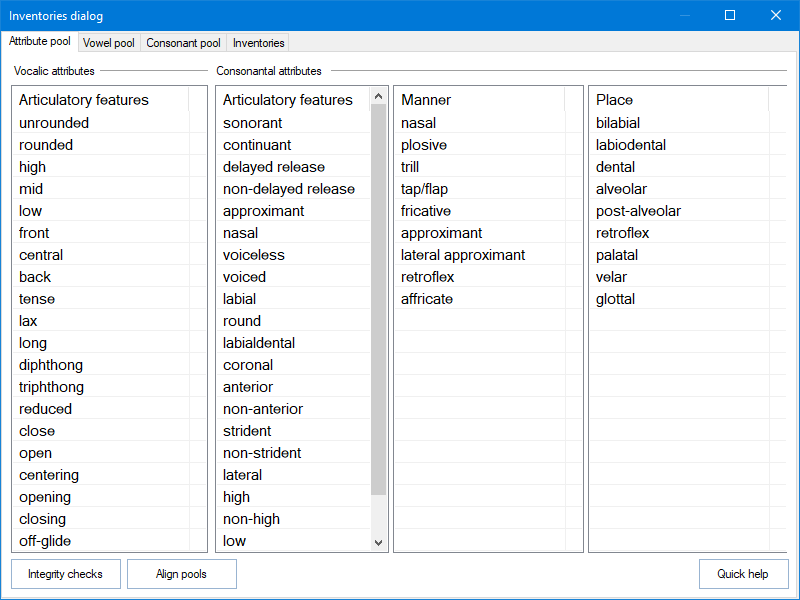 'Import' consonants from phonological specification files. 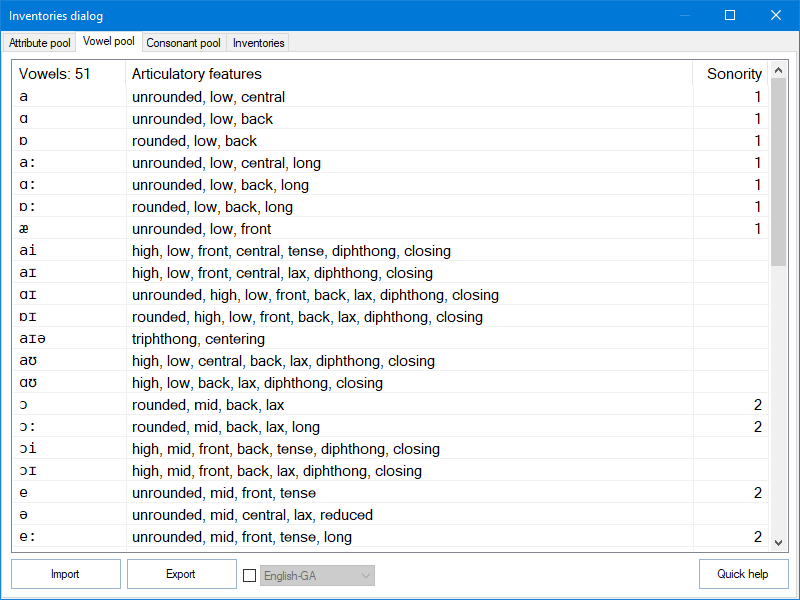 'Export' all/selected consonants to a phonological specification file. Press INS to insert a new inventory. Press Alt + INS to duplicate an inventory. Press DEL to delete the selected inventory. Right-click to rename an inventory. Click on the header to sort inventories. Press Ctrl + Up/Down to rearrange the selected inventory. Tooltips show the full paths of inventories. Inventory files can be dragged and dropped directly from Explorer. Press INS to insert a new segment. Press Alt + INS to duplicate a segment. Press DEL to delete selected segments. Right-click to rename a segment or its attributes. Press Ctrl + Up/Down to rearrange selected segment. Segments can be dragged and dropped on another inventory. 'Load' additional inventories from disk. 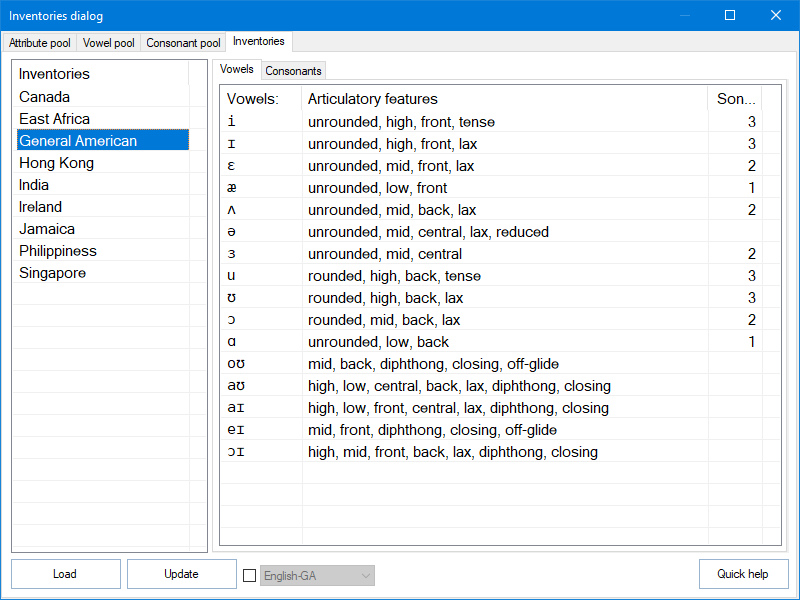 'Update' vowels, consonants, and inventories with the segment information in the pools. Press INS to insert a new marker. Press Alt + INS to duplicate a marker. Press DEL to delete selected markers. Right-click to rename a marker. Press Ctrl + Up/Down to rearrange selected markers. Click on the header to sort consonants. Double-click to copy selected consonant to the inventory. Press INS to insert a new grouping. Press Alt + INS to duplicate a grouping. Press DEL to delete selected grouping. Right-click to rename a grouping or its attributes. Press Ctrl + Up/Down to rearrange selected grouping. Groupings can be dragged and dropped on another inventory. Press INS to insert a new rule. Press Alt + INS to duplicate a rule. Press DEL to delete selected rules. Right-click to rename a rule. Click on a header to sort rules. Press Ctrl + Up/Down to rearrange selected rules. Rules can be dragged and dropped on another grouping. Press INS to insert a new flag under the selected one. Press DEL to delete the selected flags. Left-click on column 'symbols' to edit them. Double-click on a flag to change its color. Press Ctrl + Up/Down to rearrange selected flags. To install Transcripteur, execute the setup program. Once installed, Transcripteur can be invoked from the Start menu, the Desktop, or directly from its installation folder in the hard drive. Transcripteur’s setup includes an uninstaller utility. To run the uninstaller, navigate through the Start Menu or through the hard drive to Transcripteur's folder. Alternatively, it is possible to uninstall Transcripteur through the Programs and Features applet located in the Control Panel. Transcripteur requires the .NET Framework 4.7. If absent, it will have to be installed manually. If in doubt, please use the installer as it will automatically install .NET Framework 4.7 as necessary. Beyond this requirement, Transcripteur is 100% portable in and of itself. If the contents of the folder where Transcripteur is installed are copied elsewhere (a USB flash drive, for example), Transcripteur will work perfectly. For convenience, an uninstaller-free zip file is also available for download. This document provides an introduction to the capabilities of Transcripteur. If you have any questions, please use the contact form below. All fields are required.